On Wednesday 2018-08-01, @dvk01uk from myonlinesecurity.co.uk tweeted about a recent example of malicious spam (malspam) pushing malware (link to tweet). In recent weeks, this type of malspam has been pushing malware using the Agent Tesla keystroke logger. It looks like Agent Tesla is still involved with today's malspam, but this time, it's not so straight-forward. An Agent Tesla binary was found hiding in an animated gif. Today's diary examines the malspam, infection traffic, and associated malware. 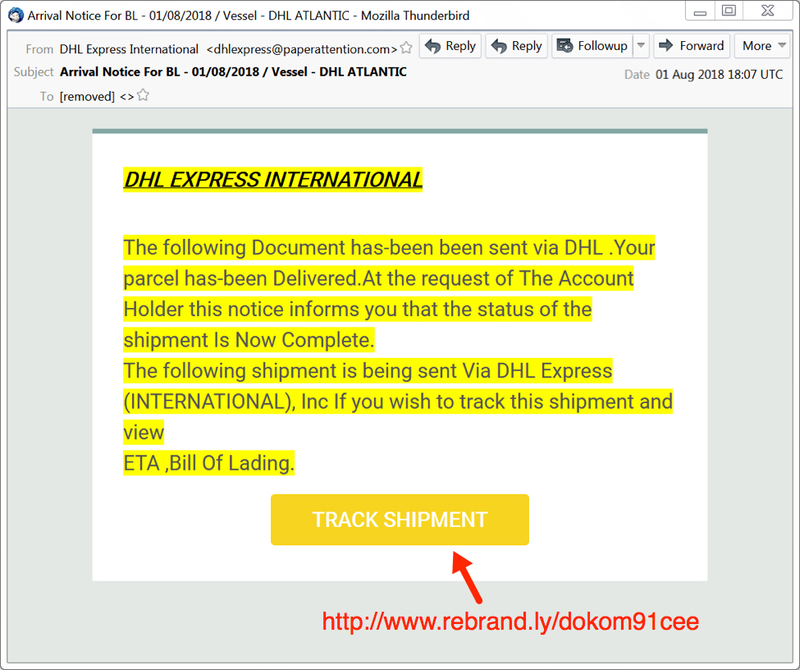 Shown above: Screenshot of the fake DHL email. The link returned a zip archive that contained a file named "Arrival Notification.exe" which looks like "Arrival Notification" when the file extensions are hidden (a default setting for Microsoft Windows). In my lab host, double-clicking Arrival Notification.exe caused it to copy itself to the user's AppData\Roaming directory. 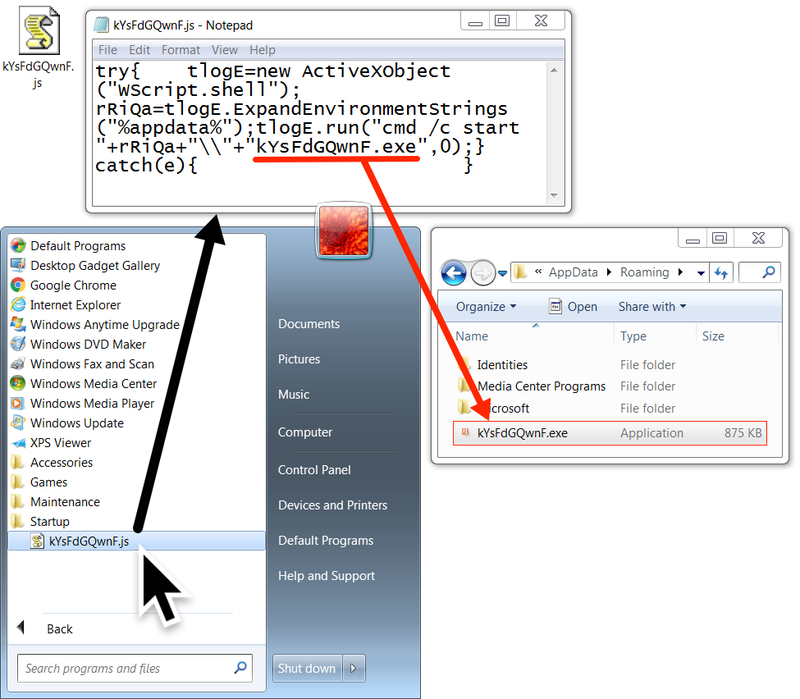 This malware was made persistent through a script file in the Windows Startup folder. Shown above: Downloading malware from link in the email. Shown above: Malware made persistent on my infected lab host. 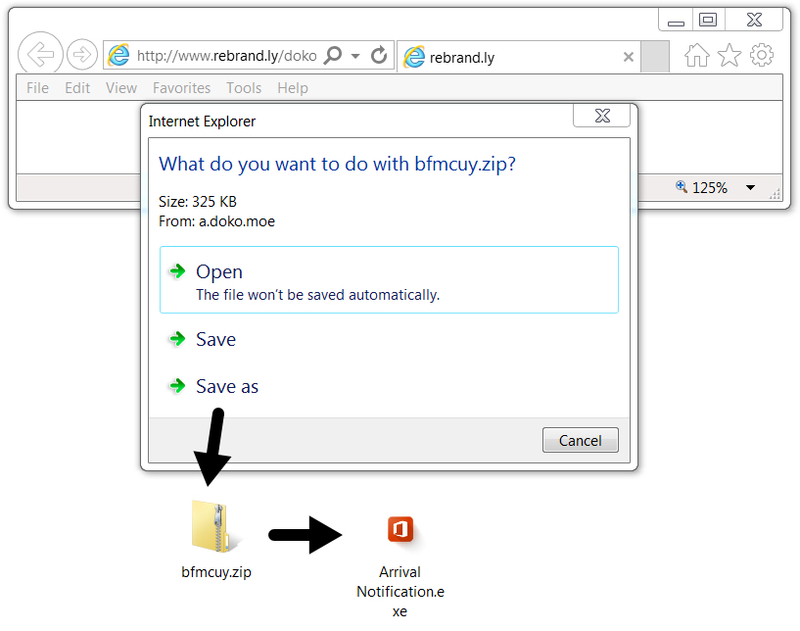 Network traffic consisted of the URL from the email, which redirected to a different URL to deliver the zip archive. After that, I saw an HTTP request to mydocuments1.is that returned an animated gif. The final line of infection traffic was an IP address check by my infected lab host to checkip.dyndns.org. The HTTP request to mydocuments1.is returned an animated gif, which is somewhat strange. This gif was provided to Didier Stevens, who quickly found and extracted two malware binaries from it--a Windows EXE file and a Windows DLL file. According to Didier, the malware binaries were appended to the end of the gif. I reviewed the gif in a hex editor and found the PE headers for both files. It was pretty easy to carve out the binaries based on that. Shown above: An animated gif of me reviewing the animated gif in a browser (I call it "gifception"). Shown above: Reviewed the gif in a hex editor and found the start of the 1st malware binary. Shown above: Start of the 2nd malware binary when reviewing the gif in a hex editor. Outside of the embedded malware in the animated gif, I couldn't find anything unusual in my lab setup. I could not find either items of malware extracted from the gif in my infected lab host, and I didn't see any Agent Tesla-specific traffic during the infection. Criminals have embedded malware in images before, so this is not a new trick. Still, I don't commonly run into this technique among the mass-distribution malware I frequently see. Embedding malware in an animated gif might provide a way to avoid detection by security solutions. As I write this, the gif shows a detection ratio of 3 / 58 in VirusTotal. Shown above: Low detection rate in VirusTotal for gif with embedded malware. A pcap of the infection traffic, associated malware, and the email example for today's diary can be found here.